After getting a taste of the Lusso version last year and naming it our favorite car of 2016 we finally got a chance to savor the Abarth version. The 124 Spider Abarth gets a small bump in power over the lesser models putting out 164 hp @ 5500 rpm and 184 lb-ft @ 2500 rpm. The Fiat 124 Spider gets pretty stiff suspension in Classico and Lusso flavors but the Abarth?s tuning is the most aggressive among them. The Abarth adds Bilstein dampers, bigger wheels 17 inch wheels with grippier tires, a throatier exhaust system,with quad exhaust, Brembo brakes and Recaro sport seats. Not forgetting though is that the Abarth gets a limited-slip differential over the standard Fiats which is a recipe for a tail-sliding grin fest. An LSD in a small, lightweight, rear-wheel-drive sports car is a recipe for huge fun. Finally the Abarth has a Sport switch makes the throttle feel more immediate, adds a tad more weight to the steering and slackens off the ESP and traction control. The exhaust isn?t quite as obnoxious as it is in the Fiat 500, which scared a few pedestrians in the week we had it but it doesn?t matter here, with the top down the aural sensations are a pure delight. 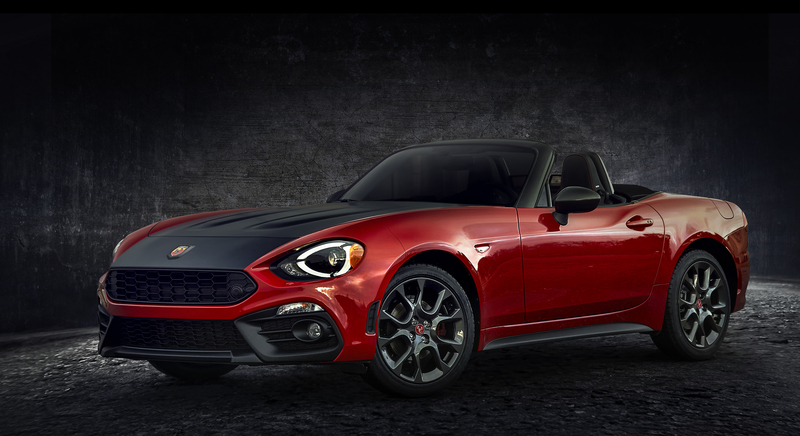 When FCA delivered us the 2017 Fiat Spider Abarth, we thought there had been a mistake as the hood was not matte black as we had expected. The car was completed covered in Gelato White paint. On closer inspection we noticed the scorpion on the trunk, all was well. I actually prefer the solid color paint, instead of the matte black hood. The Abarth along with the other 124?s are unahsamably retro but I prefer the look to the very Japanase Miata. Read more on Business 2 Community.